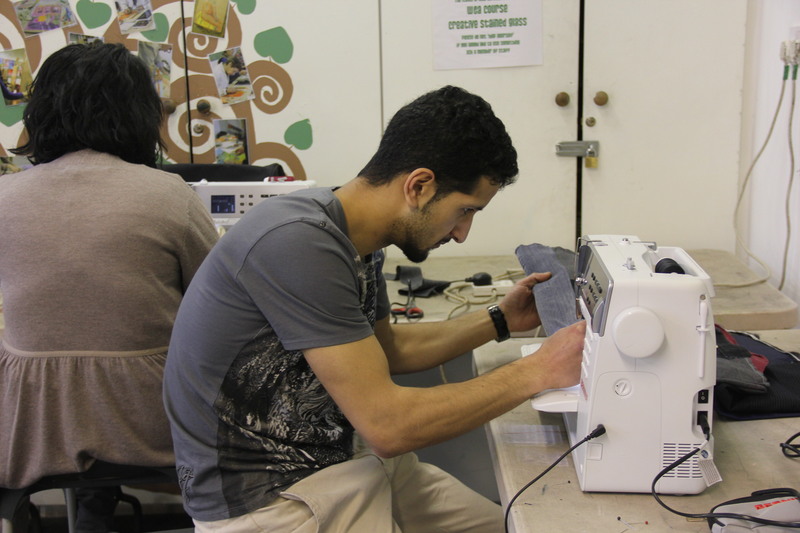 We have spent some time recently working with a group of young people on a project called Golden Threads. Young Ambassadors, a group based at Bradford Museums and Galleries meet regularly to share, discuss and enjoy arts and heritage based events and projects. Golden Threads was part of the London 2012 Festival and Stories of the World, a Cultural Olympiad programme. 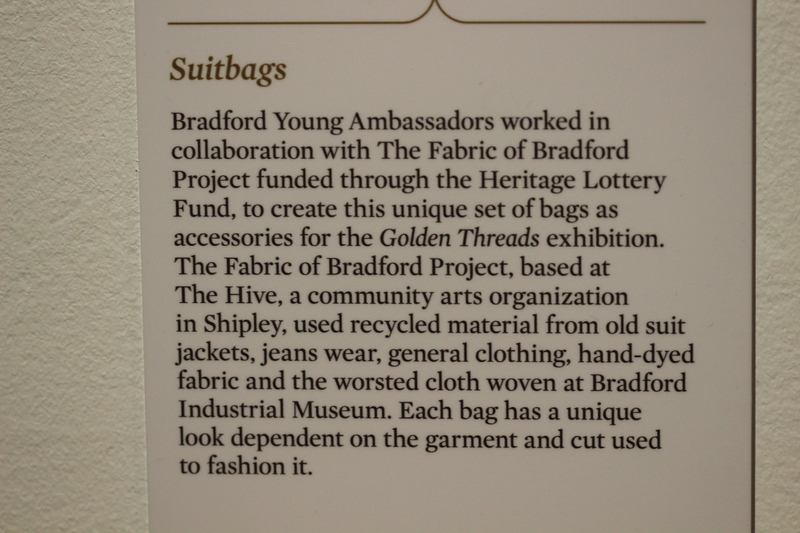 As a continuation of the project a new exhibition Golden Threads Accessorised has allowed the Ambassadors to explore and re-interpret Bradford collections by creating new, vintage style accessories using historic designs with a vintage twist. 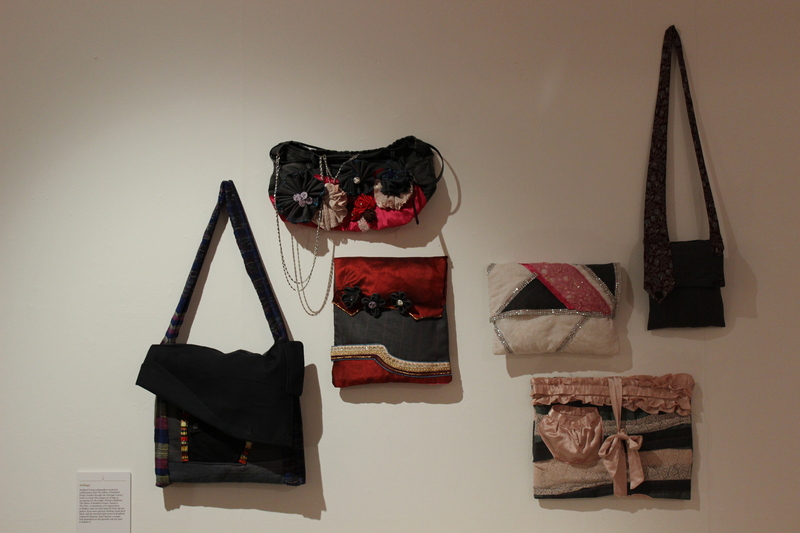 We worked with the group creating a collection of upcycled bags. 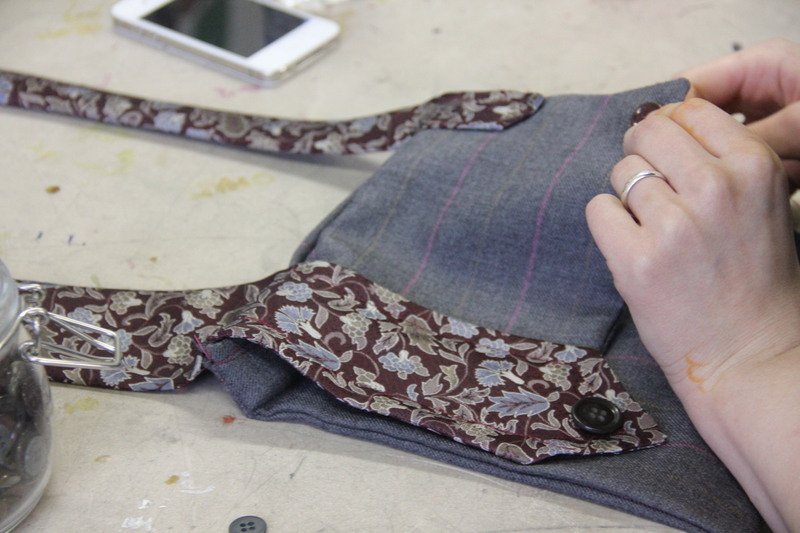 These were constructed using recycled gents suiting, items from the participants’ wardrobes, hand-dyed fabrics and worsted cloth woven at Bradford Industrial Museum by the group. The workshop sessions explored attitudes to reuse and sustainability in textiles, linking stories of the textile heritage of the area with contemporary concerns about production and materials. 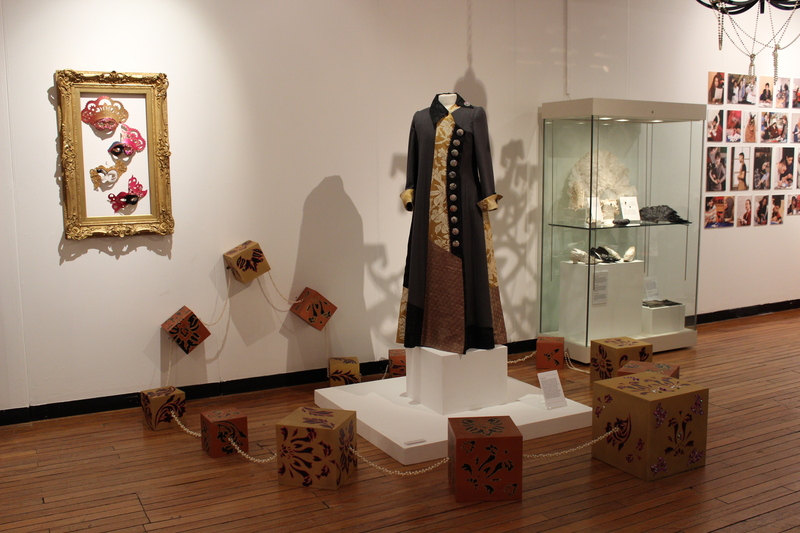 Golden Threads Accessorised is at Cartwright Hall Art Gallery until 13th September. Looked around the other exhibits, including these Turkey Red examples, complete with original recipes for the laborious process used to create it. It was a great morning, full of information and inspiration. We’re very lucky to have resources like this on our doorstep. 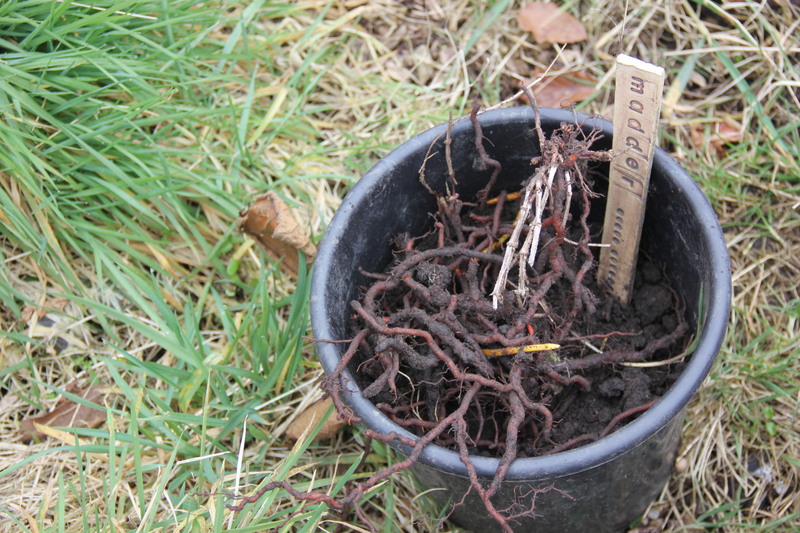 This week we’ve been having a look at red dyes which necessitated a quick trip to our allotment. 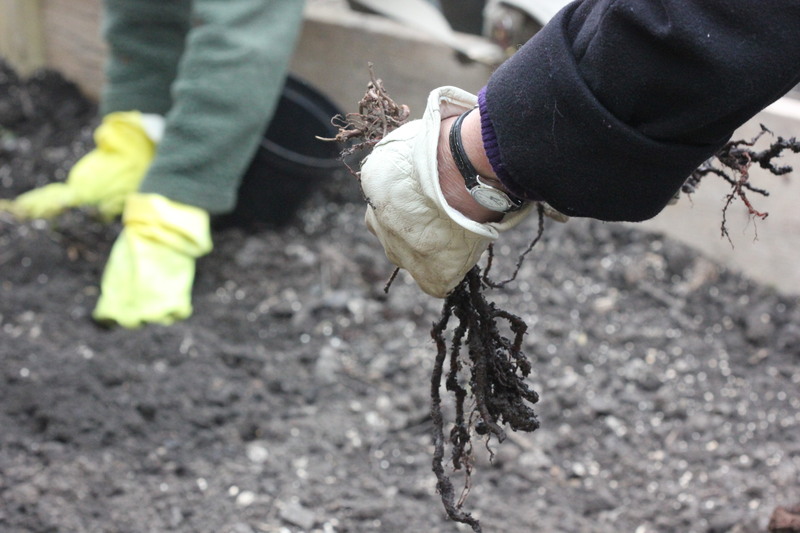 We dug up and separated some Madder (Rubia Tinctorum) plants that were grown from seed two years ago as part of another Hive project. 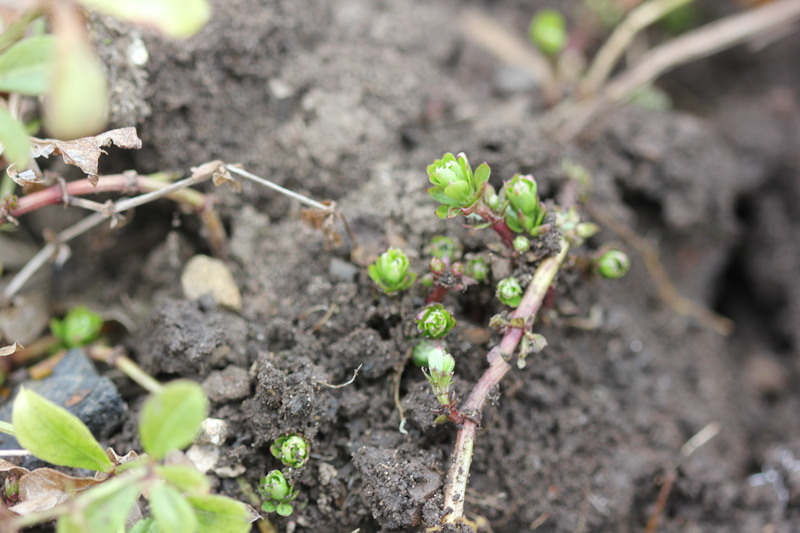 Madder needs to be at least two years old before the roots can be used as dye, so these should be ready to harvest in the summer. We also brought back some Sweet Woodruff. 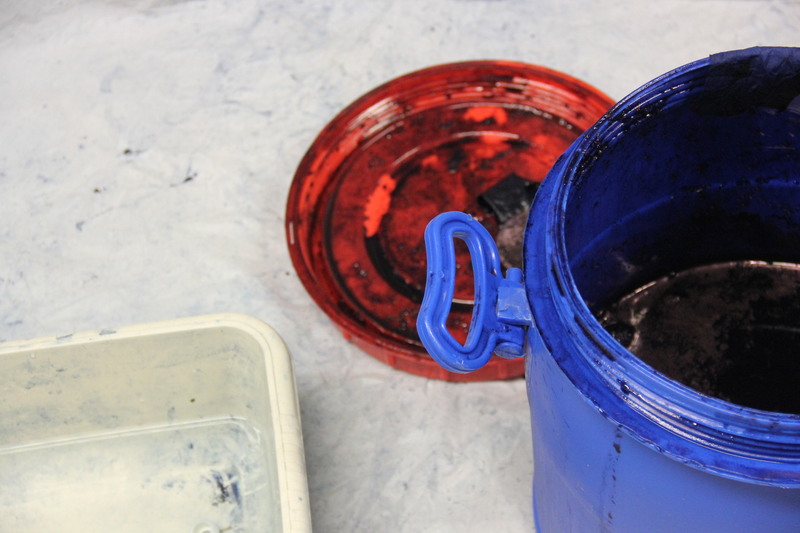 This is in the same family as madder, producing paler reds and pinks in the dye bath. 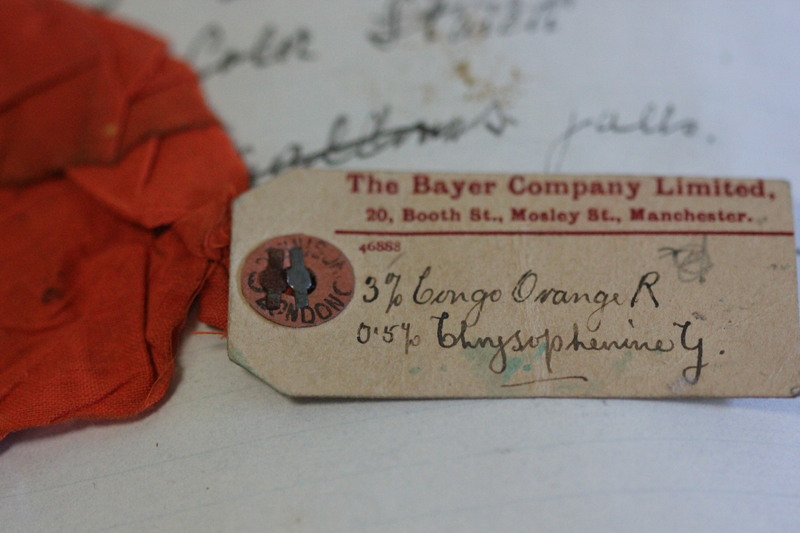 In our session we looked at some madder samples from the 18th and 19th century, and discussed the processes of creating Turkey red dye. 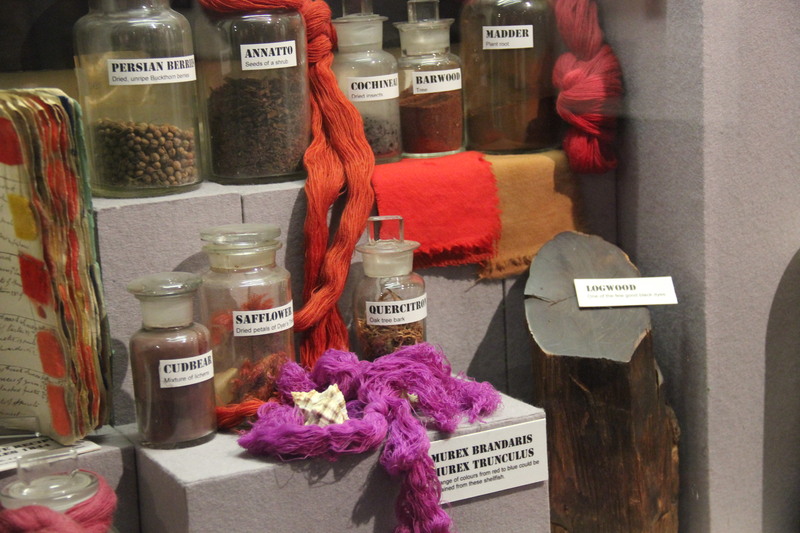 In Bradford madder was imported in huge quantities, and used to ‘top’ the dyebath, after wool had been ‘bottomed’ with woad or indigo in the creation of black dyes. We prepared the ‘Red Bed’ in the Community Dye Plant Garden last week, using limestone chippings, and also a lime top dressing, ready for the addition of these plants. Adding lime to the soil helps to create better reds. We are also growing new plants from seed to keep our supply going for the duration of the project. Our dye garden is a patch of waste ground and we’ve had a few challenges with the site. These have mainly involved rubbish (a fine crop of crisp packets and takeaway containers have been dug up) and sycamore shoots that needed removing. 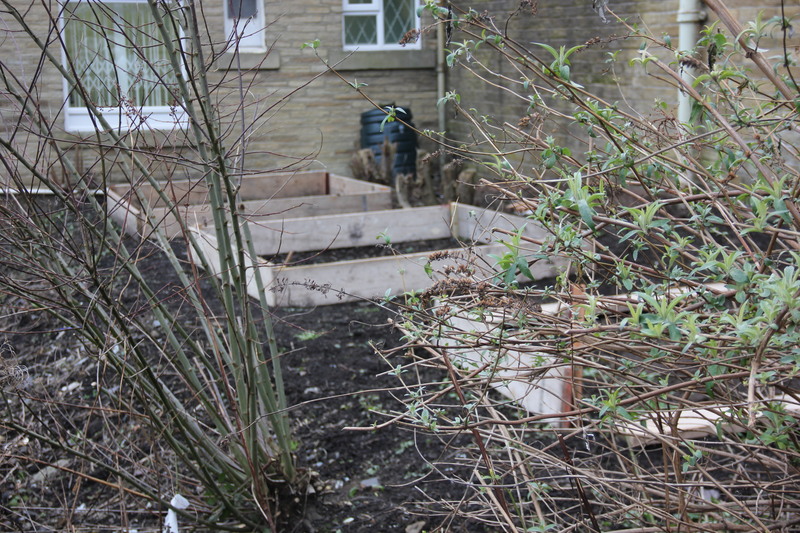 Our raised beds are going in and we’ve snatched the moments between snow storms and torrential rain showers to continue weeding. Our first group of gardeners seems to be undaunted by this and is keen to get going. 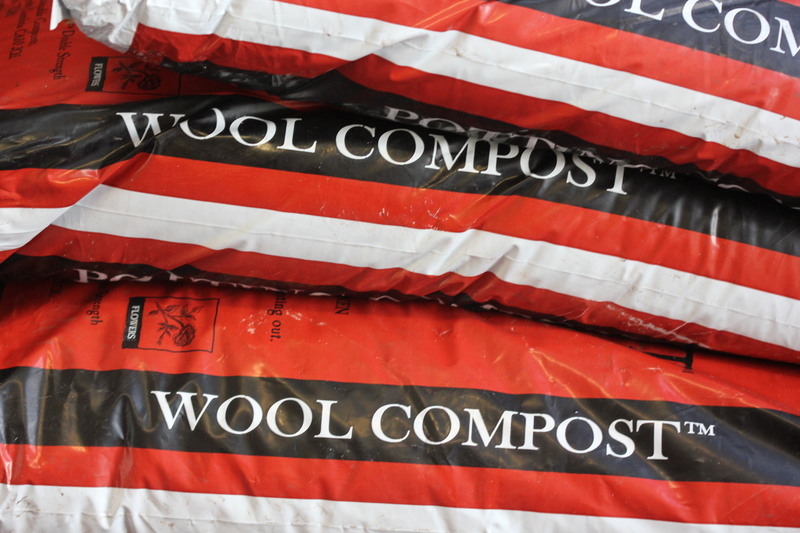 This is wool compost, kindly donated to the project by Dalefoot Composts. There is a nice circularity in using a by-product of the wool industry to grow our seedlings, which we will then use to dye our wool. This product is made from renewable resources, is peat free, and is made using a traditional recipe. 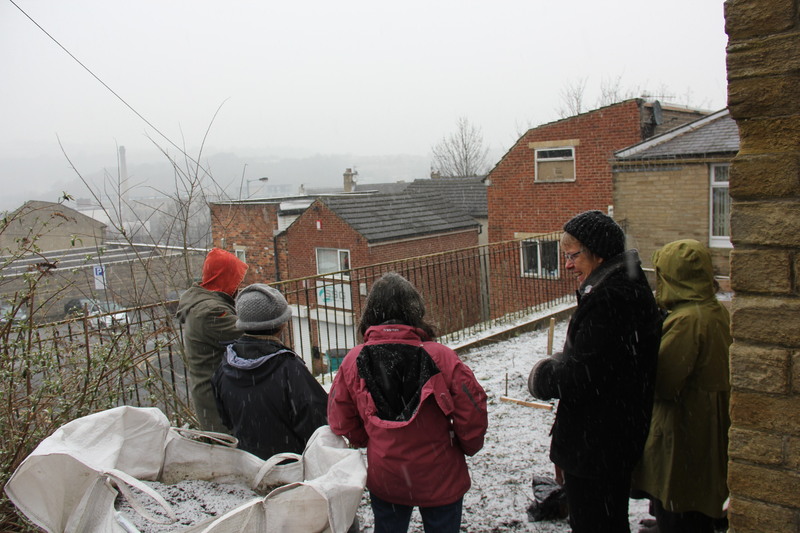 We’ve planted our indigo seeds, and our first horticulture session with Bradford Community Environment Project will happen later in the week. Looking forward to showing some green shoots very soon. This week we’ve been out and about around Bradford getting started with new groups and delivering taster sessions to other possible participants. 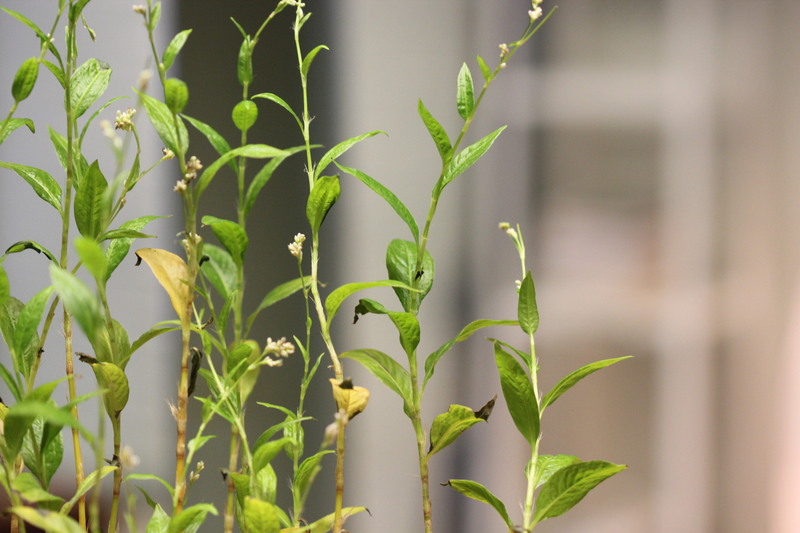 Our focus has been on the Indigo plant and the importance of it to the Bradford Trade. 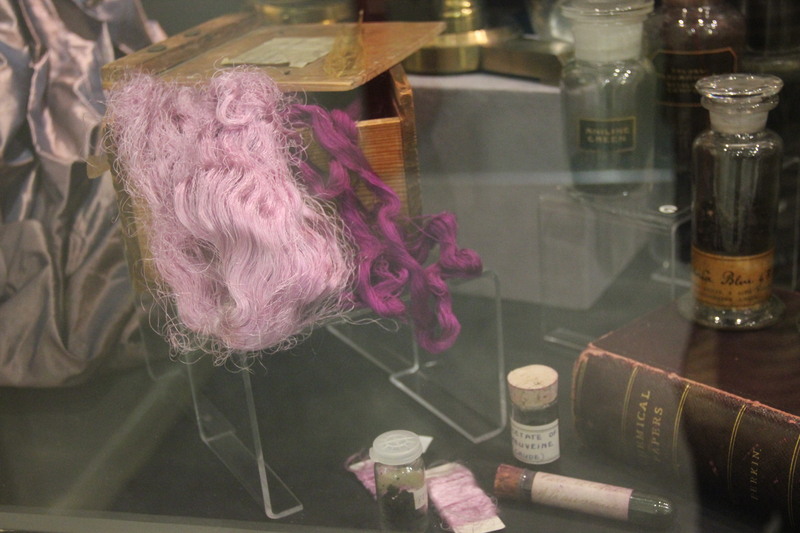 Indigo had a specific function in the manufacture of black and dark-coloured cloth, a Bradford specialism. 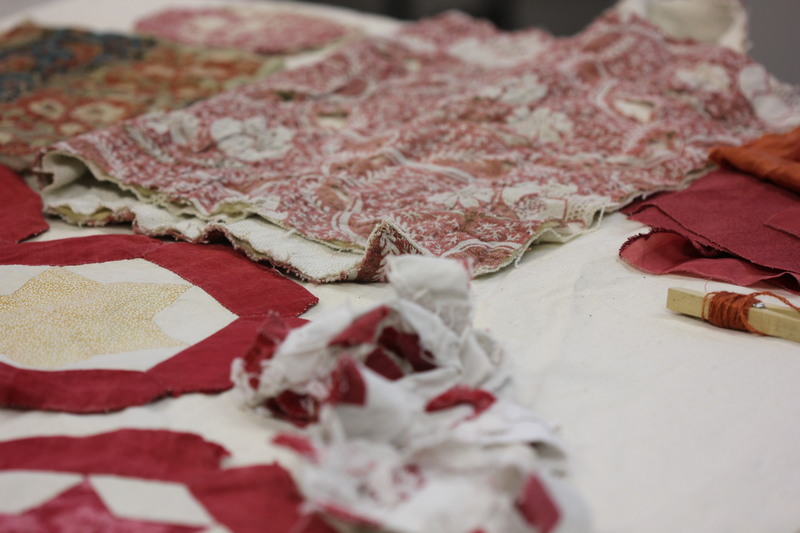 It was used to ‘bottom’ the fabric, a process where two dyes are used to deepen the shade achieved. 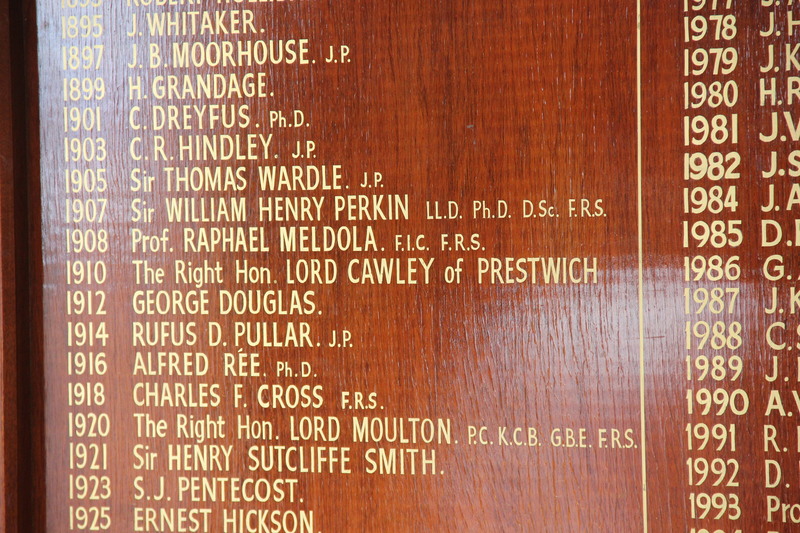 The fabric was then ‘topped’ with other dyes and modifiers to create good blacks. In the 1880s Indigo arrived in Bradford at City Road Goods Station, at the Aire and Calder Navigation Docks from Goole, and at the Liverpool Canal Wharfe. 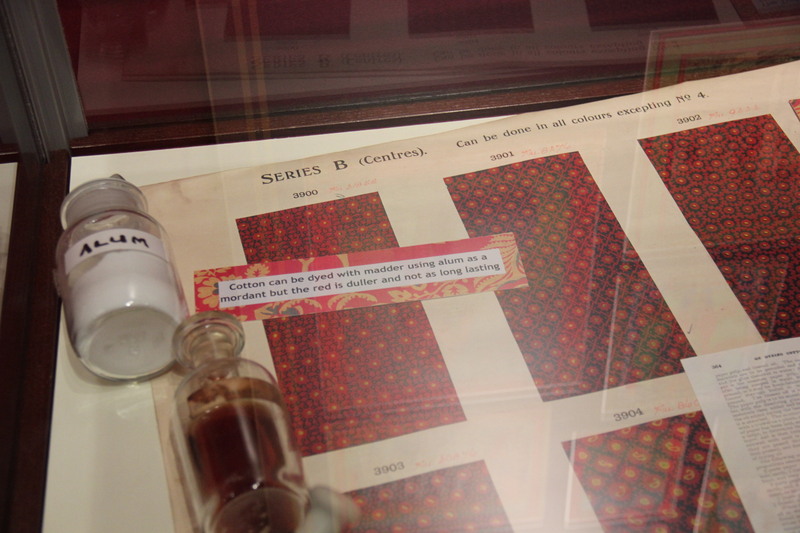 The imports would be largely from India and arrived as four inch cubes that were then crushed and processed using specific machinery in the dye houses. 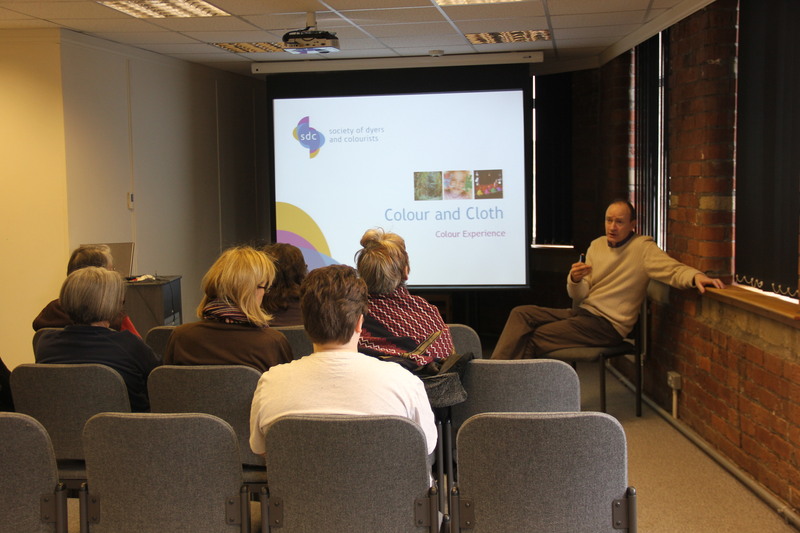 By growing the plants and using the dyes in workshops we are hoping to give participants a fuller understanding of the origins of colour in our textiles, and how the dyeing industry was crucial to the development of Bradford during the nineteenth century. 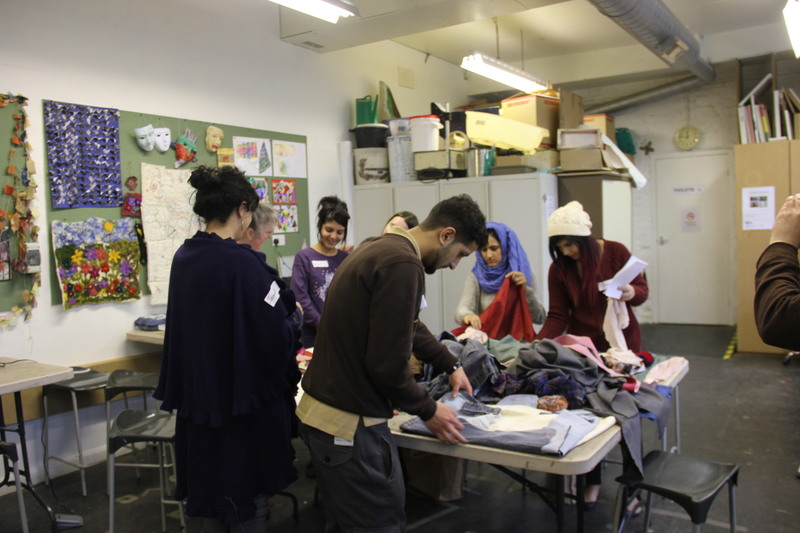 Participants at a group in Manningham prepared patterns before making an indigo dyed book bag. 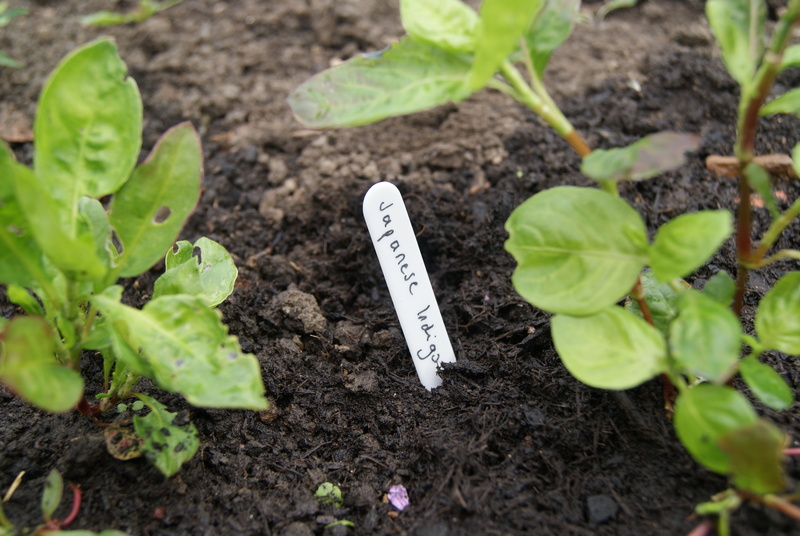 Our new Dye Garden group will be planting Japanese Indigo seeds next week, and hoping for a good growing season. 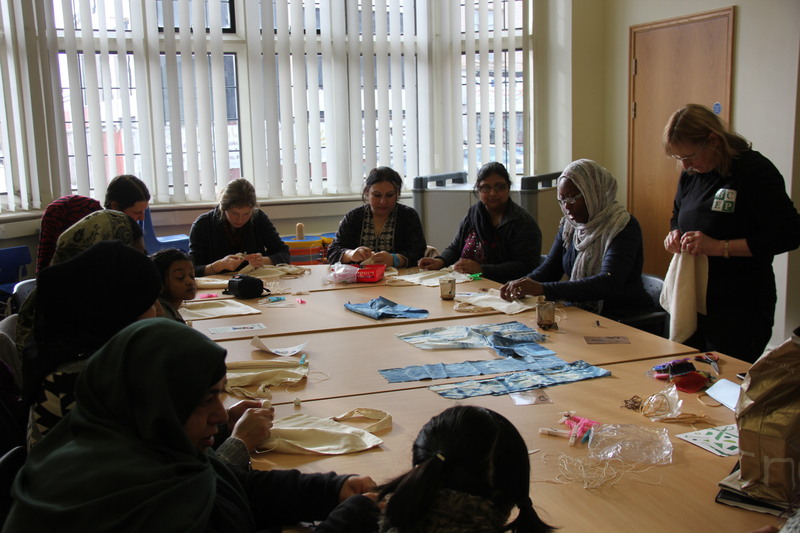 The Fabric of Bradford begins its project-based work around the city next week. Activities begin in West Bowling with a community based group. This part of Bradford was the site of Bowling Dye Works, the largest piece dyeing works in the world at the turn of the 20th century. 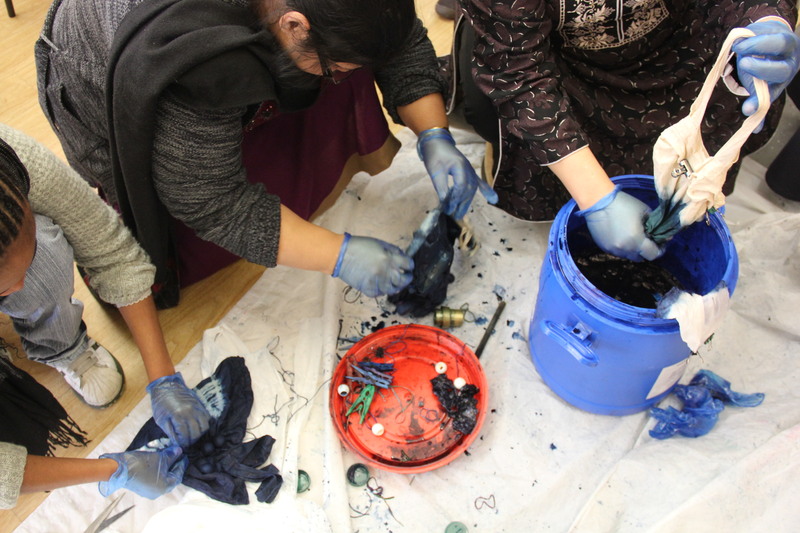 In addition, a group based at Hive will be developing our Community Dye Garden. 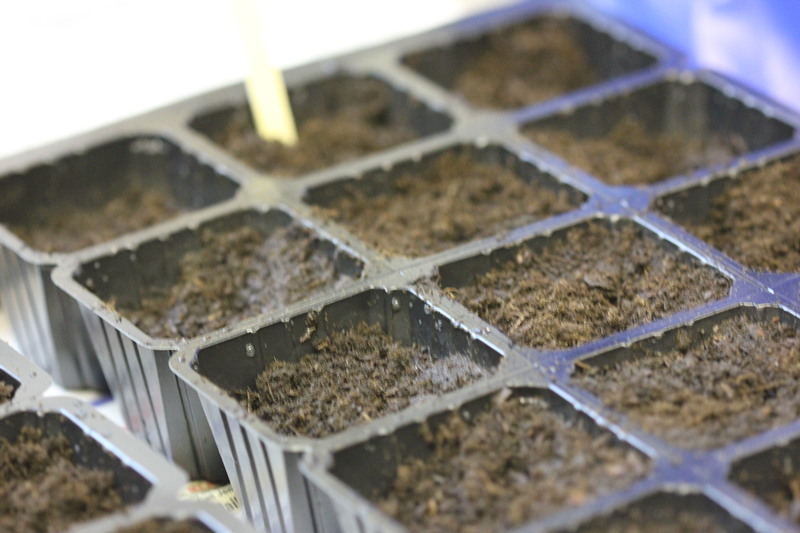 Our seeds are ordered, the wool and bracken compost is on the way and we are raring to go. We will be updating this blog with news of these and other projects frequently from now on. 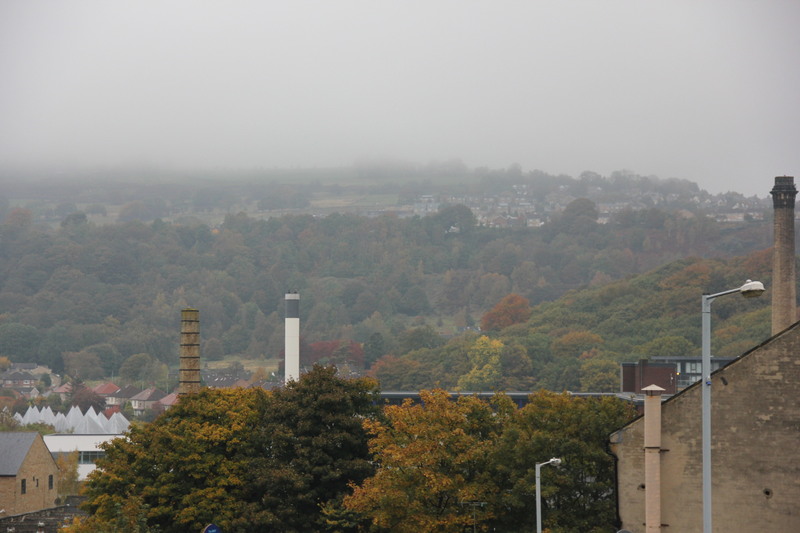 Welcome to the Fabric of Bradford blog. Thanks to a Your Heritage grant from the Heritage Lottery Fund Hive will be working on this community based project for the next two years. The Your Heritage programme offers grants for projects that relate to the local, regional or national heritage of the UK. 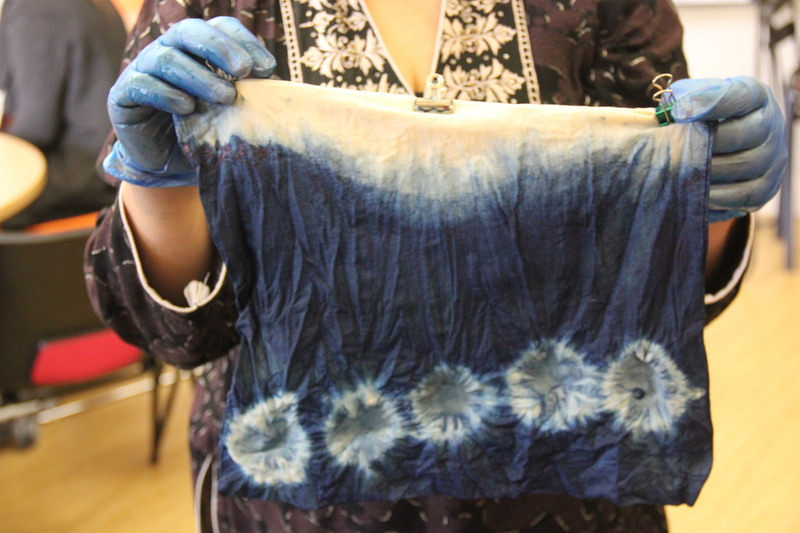 We will explore the rich textile heritage of the Bradford area and research the dyeing industry through hands-on learning activities and workshops for a wide range of community groups. For more information see our about section. This blog will follow the progress of the project and become part of a permanent online learning resource.